Electronics and cars are a tricky combination. While the advantages of systems like in-dash navigation and text-to-speech SMS reading are obvious, every extra gadget that travels with you while you're driving has the potential to be a dangerous distraction. Google may be looking to solve that problem, at least as it applies to wearable devices like Android Wear watches. 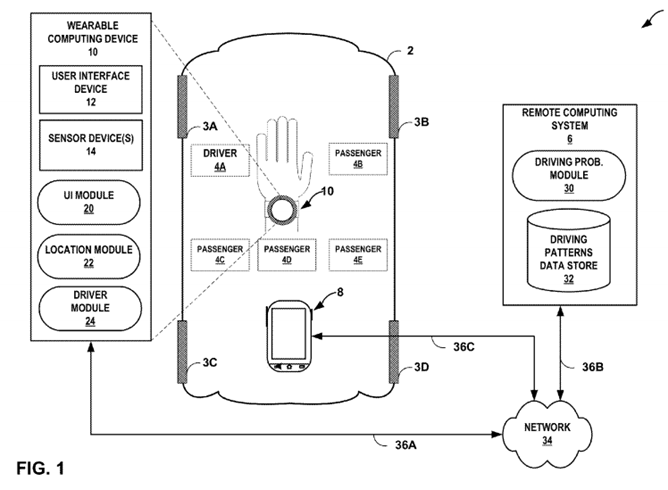 A recent patent published by the USPTO indicates that Google has developed (or at least conceptualized) a system for detecting whether a wearable user is actively driving the vehicle or merely a passenger. US patent number 9,037,125 was filed on April 7th of last year, credited to Mohammed Waleed Kadous and assigned to Google. (The full information is available at the Patent and Trademark Office's online database.) 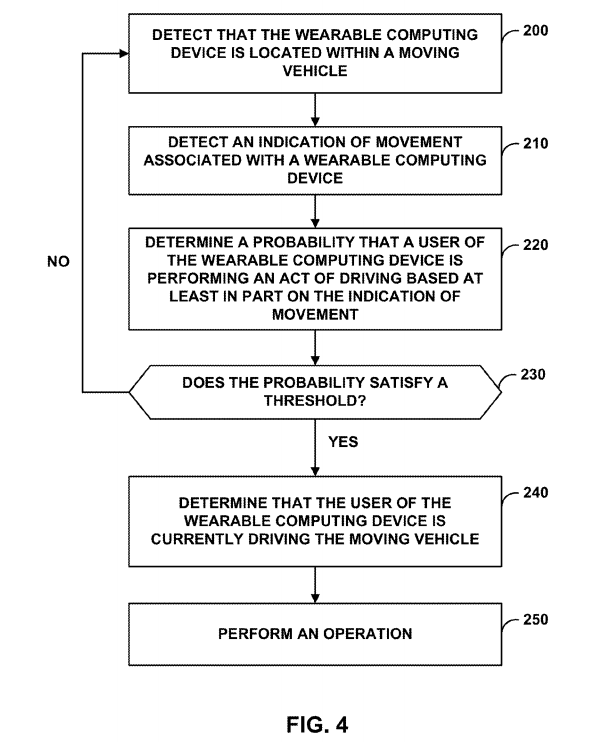 The proposal uses a combination of both positional determination (i.e., is the user sitting in the driver's seat?) and motion detection and attempts to determine with a variable degree of probability whether the user is actively driving. 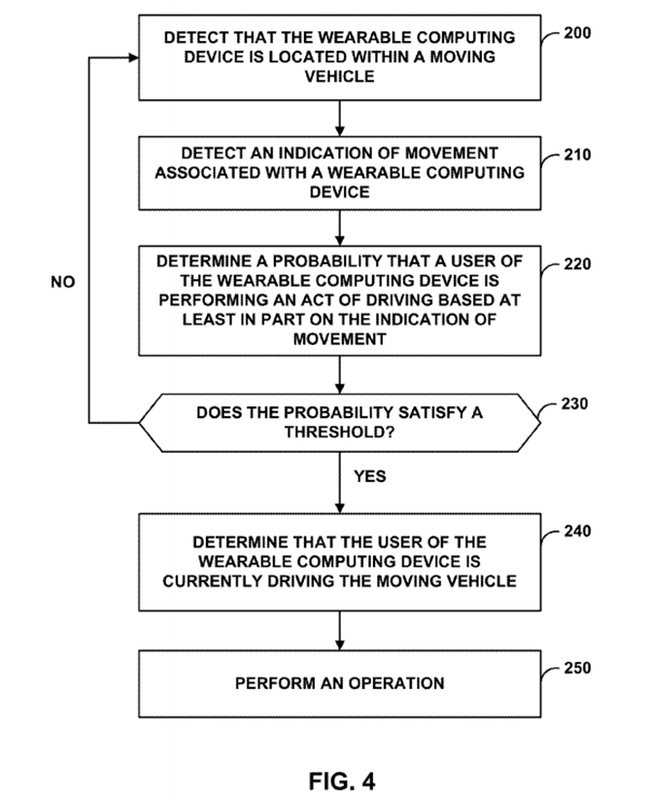 Detectable motions include turning the steering wheel and operating a gear shift, probably using some of the same technology that lets Google determine whether you're walking or riding a bike, et cetera. The wearable and/or the phone it's connected to can then react to that information, presumably for functions like disabling incoming calls or message notifications. Systems for detecting simple speed and motion already exist, but they can only determine whether you're inside a moving car or not, which isn't much use if you're a passenger who wants full access to your device's communication capabilities. Implementing a system like the one described in patent 9,037,125 could make some very effective safety tools without reducing usability for non-driving users. As always, remember that a patent application merely indicates a formalized idea - it's not proof that something like this is coming sometime in the future.